I’ve always loved that concept, and it’s very true. Pilots are human, and they make mistakes. Having a crew (instead of a single pilot) means that someone is there to cross-check and back up the other guy. We’ve all had the experience of setting the wrong altitude or heading after misunderstanding the controller, but the other guy is there to question and correct that move. We use checklists as a tool to reduce the chance of human error. We have a checklist for each phase of the flight, from preflight to approach and landing, and great care is taken to hit every item on the list. If something is missed, it’s usually due to a distraction or rushing. That’s why a standard part of many pre-flight briefings is specifically not to rush. We make a point to do everything deliberately and at a measured pace. But…as I said, we’re human. And occasionally a situation arises where two competent, well-meaning pilots both make the same mistake. I had a flight over a decade ago where we both allowed ourselves to be rushed. We were in our MD-88 at La Guardia and had just pushed off the gate for a flight to Florida. They were using runway 31 for departure, which meant we had a very short taxi to the runway (only about 100 yards). I started both engines, and as the ground crew was disconnecting the tug from the airplane’s nosewheel, the Captain told me to contact Ground Control to get our name in the hat for taxi clearance. We could see several airplanes down the taxiway coming our way, and we didn’t want to end up last in that line. We rushed, and it was a self-imposed pressure. This is a problem many pilots have to guard against. We’re all very mission-oriented, and we want to get you to your destination without delay. Because of our focus on getting in line quickly, the Captain didn’t call for, and I neglected to perform, the “After Start” checklist. One of the items on that list is opening the engine bleed air valves and turning on the air conditioning and pressurization packs. This meant there was no airflow in the cabin from the overhead vents, but more importantly, there was no airflow for pressurizing the airplane. It was my takeoff, and I called for the “After Takeoff” checklist as we passed 1,000 feet on the climbout. Here was our second chance to catch the problem and rectify it. One of the items on the “After Takeoff” checklist is to check the pressurization, but the Captain somehow didn’t catch that the packs weren’t on (or perhaps he noted that the pack switches were correct, but failed to notice that the engine bleed valves were still closed). In any case, this was mistake number two. I could have backed up the Captain, but I was hand-flying the plane and didn’t even look up at the gauges on the overhead panel. You can be sure that ever since that flight, I have always taken a glance at those gauges during the climb. We were cleared to Flight Level 240, and as we climbed through 10,000 feet we got an amber caution light and an aural alert, along with a message reading CABIN ALTITUDE. I looked up at the cabin pressure and saw that the cabin was climbing along with the plane, i.e. it wasn’t pressurizing. I alerted the Captain and we both recognized that the packs were off. Recycling didn’t do the trick, so he pulled out the QRH (Quick Reference Handbook—a book of special checklists used for abnormal and emergency situations). 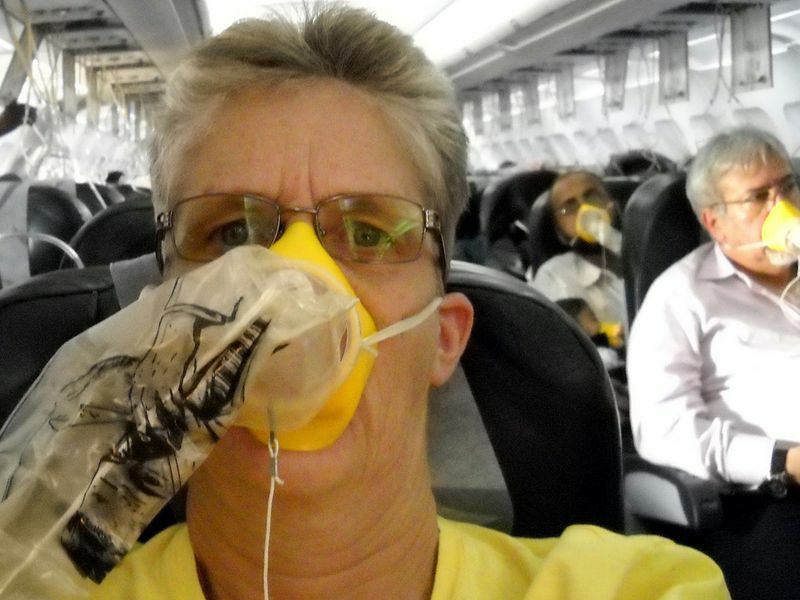 The airplane was climbing like a scalded ape, and by the time I told the controller we needed a lower altitude, the cabin had zoomed through 14,500 feet, which is the automatic trigger point for dropping the oxygen masks in the passenger cabin. This was the first and only time I’ve ever had this happen. Naturally the passengers were concerned, though it was never life-threatening. We descended to 10,000 (no oxygen needed there) and finally got the system on line. We ended up diverting to change planes and continued to our destination. So, ironically, our rushing to save a few minutes ended up delaying our passengers for probably an hour or more. One of the biggest surprises to me was that all of them got on the second plane with us.